The use of the words 'must', 'must not', 'should', 'should not' and 'may' comply with RFC 2119. Website of World Cube Association: www.worldcubeassociation.org. Original source of the WCA regulations: www.worldcubeassociation.org/regulations. WCA regulations in PDF format. Chinese translation by Shihang Wang. Version 2008. Finnish translation by Petri Vanhala. Version 2008. French translation by Pierre Calendini and Gilles Roux. Version 2008. Hungarian translation by Olivér Nagy. Version 2008. Japanese translation by Masayuki Akimoto. Version 2008. Korean translation by Park Joon-Ho. Version 2008. Polish translation by Stefan Lapicki. Version 2008. Portuguese translation by Pedro Santos Guimarães and Rafael Werneck Cinoto. Version 2008. Spanish translation by Alexandre Toledo Guillén. Version 2008. Thai translation by Chonlathep Kitsinthopchai. Version 2008. 1a) A competition must have the following officials: an organisation team (with one or more members), a WCA delegate, a main judge per event, judges, scramblers and score takers. 1b2) Making a printed or electronic version of the WCA regulations available at the competition. 1c3) Sending the competition results to the WCA Board. Results should be available at the end of the last day of the competition. 1c4) Sending corrections to the competition results to the WCA Board. Corrections should be available within one week after the competition. 1c5) Advising the other officials when needed. 1c6) Approving all events and event formats of a competition, before the competition starts and when changes are needed during the competition. 1c7) Decisions on disqualification of a competitor for the competition, as described in other articles. 1d1) Making sure that the regulations are followed. 1d3) Decisions on starting a round later or earlier than scheduled. In case of changes in the time schedule, there should be a clear announcement to all competitors. 1e2) All competitors must be available for judging, if needed by organisation team. Penalty: disqualification of the competitor for the competition. 1f1) A scrambler for an event is responsible for applying the scramble sequences to the puzzles. 1f2) All competitors must be available for scrambling, if needed by organisation team. Penalty: disqualification of the competitor for the competition. 1g2) Changes to the score sheets must only be made with consent of the main judge. 1h) Competitors can be divided into groups to handle large events or to enable competitors to help with scrambling or judging. 1h1) Competing judges/scramblers for a round must not judge or scramble in their own group, until after they have completed all their solves for the round. 1h2) Groups must have different scramble sequences. 1j) All officials may compete in the competition, but a main judge for an event must not compete in the event. 1k) Officials can have several roles combined (organisation team, WCA delegate, main judge, judge, score taker, scrambler). 2a3) is not suspended by WCA Board. 2c) Registrants must provide all required information (at least: name, country, date of birth, gender, contact information, selected events) for their registration to be considered complete. 2d) All information (except: name, country, date of birth, gender, selected events and competition results) must be used for the competition only, and may only be given to other organisations/persons after permission from the competitor. 2e1a) The eligible countries are defined by http://en.wikipedia.org/wiki/List_of_countries. 2i) While competing, competitors must not use sound equipment, other electronic equipment (like walkmans, dictaphones or additional lighting). 2k6) The WCA Board may temporarily suspend a competitor, if the WCA Board decides that the competitor discredits the community by behaviour described in article 2k2, 2k3, 2k4 or 2k5. 2n) Competitors may dispute a ruling in verbal form to the WCA delegate. 2p) The dispute must be handled by the WCA delegate before the next round of the event has started. 2r) The competitor must accept the final ruling of the WCA delegate. Penalty: disqualification of the competitor for the competition. 2s1) For competitors with hearing disabilities, judges may replace the vocal instructions with hand signals. 2s2) For competitors with physical disabilities, judges may give help with starting and stopping the timer. 2s3) For competitors with visual disabilities, inspection and solving can be done on a puzzle with different textures or Braille objects. The solving phase must be done according to the Blindfolded Solving regulations. For the blindfolded events the solving phase must be done on a puzzle with regular stickers or tiles. 2t) Before the competition all competitors should make themselves familiar with the WCA regulations. 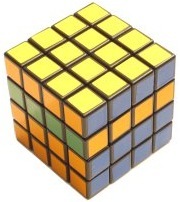 3c) Competitors must use any colour scheme for cube puzzles, as long as the puzzles show one colour per face in solved state. For other puzzles competitors must use any variation that has the same moves, positions and solutions as the original puzzle. 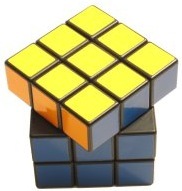 3e) Cube puzzles must either have coloured stickers or coloured tiles. 3h) No modifications are allowed that enhance the basic concept of a puzzle. 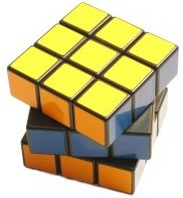 Some examples of enhancing the basic concept are: new moves are possible, normal moves are impossible, more pieces are visible, colours on the backside of the puzzle are visible, moves are done automatically, more or other solved states. 3i) Any modifications to a puzzle that result in poor performance or results by a competitor are not grounds for additional attempts in a event. 3l) Cube puzzles must have at most one logo. 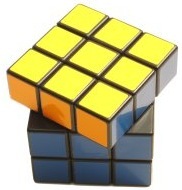 For Rubik's Cube or bigger cube puzzles the logo must be placed on one of the centre pieces. 3m) All puzzle and sticker brands are allowed, as long as the puzzles comply with the other WCA regulations. 4a) A scrambler must apply the scramble sequences. 4b) Puzzles must be scrambled using a computer-generated random scramble sequence or scrambled position, that must be kept secret for all but the scramblers. 4c) Standard metric for scrambling and solving is Half Turn Metric (See Article 12). 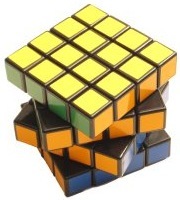 4d) Cube puzzles must be scrambled with the white (or the lightest colour by default) face on top and green (or the darkest adjacent face by default) on the front. 4e) Competitors must solve the same scramble sequences or scrambled positions per group of competitors. 6a) Awards, prizes or honours may be given to competitors according to the announcement of the competition. 6b) Competitors should attend the winner's ceremony to be eligible for awards/prizes/honours. 6b1) The winner's ceremony should be held in the competition venue, within one hour after the end of the last event. 6c) Winners of awards, prizes or honours should be prepared to talk to journalists or any media covering the competition. 7g) Competitors must solve while sitting or standing. 7h1) Competitors (or a group of competitors) who have been called to compete - and only those competitors - must stay in the competitors area until they finished all solves of the round. 7h2) For blindfolded solving the competitors in the competitors area should not be able to see the puzzles of the competitors on stage. 7h3) Competitors in the competitors area must not communicate to each other about the scrambled positions of the puzzles for the round in progress. 8a7) The Stackmat timer (at least Generation 2) must be used for time measurement. 9e) New official events may be added each calendar year, and existing official events may be removed. 9e1) The decision to add or remove an event is made by the WCA Board. 9e2) The proposal to add an event is based on a poll about the popularity of new events. The poll is held each calendar year in January and February, on the forum of the WCA website. 9e3) The proposal to remove an event is done by selecting the event with a low number of competitors in the previous calendar year. The proposal is made each calendar year in February, on the forum of the WCA website. 9e4) Other events may be held during a competition, but will be unofficial and therefore not part of the official results of the competition. 9f1) All timed results under 10 minutes, and corresponding averages/means are measured in hundredths of a second, with averages/means rounded to the nearest hundredth of a second (x.004 becomes x.00, x.005 becomes x.01). 9f2) All timed results over 10 minutes, and corresponding averages/means are measured in seconds, with averages/means rounded to the nearest second (x.4 becomes x, x.5 becomes x+1). 9f3) All counted results and averages/means are measured in natural numbers, with averages/means rounded to the nearest tenth (x.04 becomes x.0, x.05 becomes x.1). 9f6) In 'Best of x' rounds competitors get x (<= 3) attempts, with the best attempt counting. There may be a combined time limit, example: 30 minutes for 'Best of 1' or 'Best of 2'. 9f8) In 'Average of 5' rounds competitors get 5 attempts. Of these 5 attempts, the best and worst attempt are removed, with the mean of the remaining 3 attempts counting. 9f13) In 'Mean of' and 'Average of' rounds the order in the results is based on the best average/mean per competitor, with lower meaning better. 9f14) If in 'Mean of' and 'Average of' rounds competitors have the same average/mean result, then the order in the results for these competitors is based on the best result per competitor, with lower meaning better. 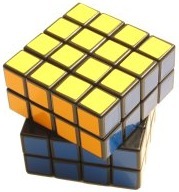 9f16) For the Rubik's Cube: Multiple Blindfolded event the order in the results is based on number of puzzles solved minus the number of puzzles not solved (higher is better). If the result is lower than 0, the solve is disqualified. If competitors have the same result, then the order is based on total time (lower is better). 9h) WCA must provide WCA world rankings for single and preferred average/mean formats where applicable. 9k) If an event is held, then all competitors may participate in that event. Events may have a maximum number of competitors. 9o1) Events with up to 8 competitors must have at most one round. 9o2) Combined rounds and Qualification rounds count as one round when counting the number of rounds per event. 9q) Events and rounds must have at least 2 competitors. 9r) A qualification round is a round of an event held before the first round of the event. The goal of a qualification round is to let unranked or low ranked competitors qualify for the first round of an event with many registered competitors. 9r2) All competitors of an event who are not directly qualified for the first round of the event, must compete in the qualification round of the event. 9r3) There may be changes to increase the maximum number of competitors in qualification round or first round, or to add a qualification round for newly registered competitors. These changes should be made at least one month before the competition. 10d) All pieces of a puzzle must be fully attached to the puzzle, and in their required positions. Exceptions: see Article 5 Puzzle defects. 10e) A puzzle is solved when all face colours are reconstructed and all the parts are aligned within certain limits. 10e1) For each two adjacent parts (for example two parallel adjacent slices of a cube) of the puzzle that are misaligned more than the limit described in Article 10f, these two parts are considered to need one move to be solved (Half Turn Metric). 10e2) If no move is needed to bring the puzzle to solved state, the puzzle is considered solved without a penalty. 10e3) If one move is needed, the puzzle is considered solved with a penalty of 2 seconds. 10e4) If more than one move is needed, the solve is ruled DNF. 10g) For Magic (and similar puzzles) the puzzle must be flat on the surface. The maximum elevation of the bottom side of the puzzle at the end of a solve is two tiles higher than flat. 10g1) If one tile or two adjacent tiles are elevated too high or folded, and the puzzle is otherwise solved, then the puzzle is considered solved, with a penalty of 2 seconds. In all other cases the result is DNF. 11f) The main judge and WCA delegate must not support their decisions with video or photograph analysis. 12a1) Clockwise, 90 degrees: F (front face), B (back face), R (right face), L (left face), U (upper face), D (bottom face). 12a2) Counter clockwise, 90 degrees: F', B', R', L', U', D' (see 12a1). 12a3) Clockwise, 180 degrees: F2, B2, R2, L2, U2, D2 (see 12a1). 12a4) Counter clockwise, 180 degrees: F'2, B'2, R'2, L'2, U'2, D'2 (see 12a1). 12a5) Clockwise, 90 degrees: Fw, Bw, Rw, Lw, Uw, Dw. (see 12a1). 12a6) Counter clockwise, 90 degrees: Fw', Bw', Rw', Lw', Uw', Dw' (see 12a5). 12a7) Clockwise, 180 degrees: Fw2, Bw2, Rw2, Lw2, Uw2, Dw2 (see 12a5). 12a8) Counter clockwise, 180 degrees: Fw'2, Bw'2, Rw'2, Lw'2, Uw'2, Dw'2 (see 12a5). 12a9) Clockwise, 90 degrees: f, b, r, l, u, d. (see 12a1). 12a10) Counter clockwise, 90 degrees: f', b', r', l', u', d' (see 12a9). 12a11) Clockwise, 180 degrees: f2, b2, r2, l2, u2, d2 (see 12a9). 12a12) Counter clockwise, 180 degrees: f'2, b'2, r'2, l'2, u'2, d'2 (see 12a9). 12a13) Clockwise, 90 degrees: M (same direction as L), S (same direction as F), E (same direction as D). (see 12a1). 12a14) Counter clockwise, 90 degrees: M', S', E' (see 12a13). 12a15) Clockwise, 180 degrees: M2, S2, E2 (see 12a13). 12a16) Counter clockwise, 180 degrees: M'2, S'2, E'2 (see 12a13). 12a17) Each move of the categories Face Moves and Double Outer Slice Moves is counted as 1 move. 12a18) Each move of the categories Inner Slice Moves and Middle Slice Moves is counted as 2 moves. 12a19) Each rotation is counted as 0 moves. 12b1) Clockwise, 90 degrees: [f] or z, [b] or z', [r] or x, [l] or x', [u] or y, [d] or y'. (see 12a1). 12b2) Counter clockwise, 90 degrees: [f'] or z', [b'] or z, [r'] or x', [l'] or x, [u'] or y', [d'] or y (see 12b1). 12b3) Clockwise, 180 degrees: [f2] or z2, [b2] or z2, [r2] or x2, [l2] or x2, [u2] or y2, [d2] or y2 (see 12b1). 12b4) Counter clockwise, 180 degrees: [f'2] or z'2, [b'2] or z'2, [r'2] or x'2, [l'2] or x'2, [u'2] or y'2, [d'2] or y'2 (see 12b1). 12c1) (x,y) means: turn upper layer x stickers clockwise, turn bottom layer y stickers clockwise, turn right half of the puzzle 180 degrees. Stickers are counted on the outside of the upper slice. 12d1b) Counter clockwise, 72 degrees: U' (upper face). 12d2a) Clockwise 72 degrees move of whole puzzle except for the slice of top left three pieces: R+ (vertical slices), D+ (horizontal slices). 12d2b) Counter clockwise 72 degrees move of whole puzzle except for the slice of top left three pieces: R- (vertical slices), D- (horizontal slices). 12d2d) Counter clockwise 144 degrees move of whole puzzle except for the slice of top left three pieces: R-- (vertical slices), D-- (horizontal slices). 12e1) Moves are applied with the bottom face completely horizontal and the front face facing to the person who holds the Pyraminx. A1a) The time limit is 10 minutes, or less/higher if announced before the event. A1b) A stopwatch is used for time measurement, in addition to a Stackmat, if the time limit is higher than 10 minutes. If the puzzle solving time is under 10 minutes, the Stackmat time is the result, otherwise the stopwatch time is the result. A2a) The competitor hands over the puzzle to the scrambler and waits in the competitors area until he is called to compete. A2e) The judge places the puzzle onto the Stackmat and covers it completely with an object. A3a1) The competitor has a maximum of 15 seconds for inspecting the puzzle and starting the solve. A3b1) When the judge and the competitor mutually agree within one minute that the competitor is ready to begin the inspection, the judge says 'READY?'. A3c1) The competitor must not apply moves. Penalty: disqualification of the solve. A3c2) If the pieces of the puzzle are not fully aligned, then the competitor may fix it, only to align the faces (for cubes the alignment must not exceed 45 degrees). A3c3) The competitor may reset the timer before he starts the solve. A3d1) When the inspection time reaches 8 seconds, the judge calls '8 seconds'. A3d2) When the inspection time reaches 12 seconds, the judge calls 'STOP'. A4b) The competitor must place his hands flat on the elevated sensor area of the Stackmat, with his fingers touching the sensors and with palms down. Penalty: 2 seconds. A4b1) The competitor must not have any physical contact with the puzzle before he starts the solve. Penalty: 2 seconds. 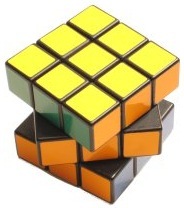 A4d) The competitor starts the solve by confirming that the timer light is green, then removing his hands from the timer, thus starting the timer. 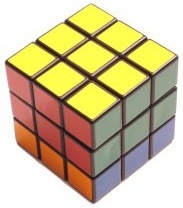 A4d1) The competitor must start the solve within 15 seconds after the start of the inspection. Penalty: 2 seconds. 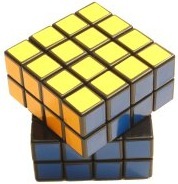 A4d2) The competitor must start the solve within 17 seconds after the start of the inspection. Penalty: disqualification of the solve. A4e) Time penalties for Starting the Solve are not cumulative. There is a maximum of 1 time penalty for Starting the Solve. A5b) While inspecting or solving the puzzle, the competitor must not have any assistance from anyone or any object (other than the surface). Penalty: disqualification of the solve. A6e) The competitor must not touch or move the puzzle until the judge has inspected the puzzle. Penalty: disqualification of the solve. A6g) The judge must inspect the puzzle without making moves or aligning faces and must determine whether the puzzle has been completely solved. A6h) In case of a dispute no moves or alignments must be applied to the puzzle until the dispute has been settled, involving the main judge if needed. Penalty: disqualification of the solve (courtesy of judge). A6i) Time penalties for Ending the Solve are not cumulative. There is a maximum of 1 time penalty for Ending the Solve. A7b1) In case of a penalty, the judge writes down the result taken from the timer, and next to it the penalty ("+2", "+4"...). B2a) The judge resets the timer and stopwatch. B2b) The competitor must place his hands flat on the elevated sensor area of the Stackmat, with his fingers touching the sensors and with palms down. Penalty: 2 seconds. B2c) The competitor must not have any physical contact with the puzzle before he starts the solve. Penalty: 2 seconds. B2d) The competitor starts the solve by removing his hands from the timer, thus starting the timer. B2d1) The competitor must remove the cover from the puzzle, after starting the timer. B2e) When using a stopwatch in addition to a Stackmat, the judge starts the stopwatch as soon as the competitor starts the solve. B3a) During the memorisation and solving the competitor is allowed to pick up the puzzle. B4b) The competitor must not apply moves to the puzzle before he has fully donned the blindfold. B4c) During the full solve the judge must keep a sheet of paper or a similar object between the competitor's face and the puzzle, unless the puzzle is in a position where peeking at the puzzle is not possible. B4d) The competitor must not look at the puzzle state at any time during the solve. Penalty: disqualification of the solve. B4e) The competitor may remove and don the blindfold until he applies the first move to the puzzle. B5c) The competitor may remove the blindfold before stopping the timer, but after removing the blindfold no moves must be applied to the puzzle anymore. Penalty: disqualification of the solve. C1a) During the solve the competitor must only use one hand. Penalty: disqualification of the solve. C1b) During the solve no other body part or any object other than the surface must touch the puzzle. Penalty: disqualification of the solve. C1b1) If the competitor drops or puts down the puzzle during a solve, then the competitor must not do moves or align sides until the puzzle has no contact with the surface anymore. Penalty: disqualification of the solve. C1b2) If a puzzle defect occurs, and the competitor decides to repair it, then repairing must be done with one hand, use of the surface is optional. Penalty: disqualification of the solve. C1c) During the solve, once a competitor touches the puzzle with one hand, he must not touch the puzzle with the other hand. Penalty: disqualification of the solve. E2a) The judge hands a scramble sequence to all competitors with a print of the scramble position. The judge starts the stopwatch and says 'Go'. E2c) At the end of the 60 minutes the competitor must have his solution written down clearly for the judge, notation according to Article 12. E2d) The metric to measure the length of the solution, is Half Turn Metric. H1a) Competitor must tell before the start of the event how many puzzles (>1) he wants to solve blindfolded for each attempt. H1a1) A competitor must not change the number of puzzles after the start of the event. H1a2) The selected number of puzzles per competitor must be kept secret until the start of the event. H1b) Total time allowed for memorising and solving is 10 minutes per cube, measured with a stopwatch. H1b1) When the total time is reached, the attempt is stopped and the number of solved and not solved puzzles is counted. The purpose of optional regulations is to give extra possibilities to manage large competitions. The organisation team of a competition may decide to apply one or more of the following optional regulations. The application of optional regulations for a competition, must be approved by WCA Board. Z1) Organisation team may collect all puzzles for scrambling "during registration". Z2) Organisation team may limit the number of events per competitor. Z3) Organisation team may select competitors who directly qualify for certain rounds of certain events, based on the results of certain competitions.